Simon rear-facing in the Fisher Price Safe Embrace Infant seat (22 lb rear-facing maximum). Simon is 13 months old and weighs about 21 lbs. Simon lives in Canada. At the time this photo was taken, the Canadian recommendations were to routinely turn a child forward-facing at 1 year OR 20 lbs OR when they pull to a stand unassisted. Simon stayed rear-facing until he was 1 year, 4.5 months old. Canada has recently (late 2005) revised their recommendations to reflect best practice: Don’t be in a hurry to start using a forward-facing child seat. 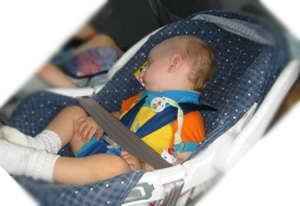 The longer you use a rear-facing infant-only seat, infant /child seat, or infant/child/booster seat that fits correctly, even past your baby’s first birthday, the safer your baby will be in a crash. Be sure to follow the manufacturer’s instructions for use and check the label for the weight and height that are allowed. *Note* The Fisher Price Safe Embrace Infant seat was sold in the US and Canada and did not include a harness retainer clip (aka "chest clip"). It does meet federal regulations - harness retainer clips are not required. It is up to each manufacturer to decide whether to incorporate one.